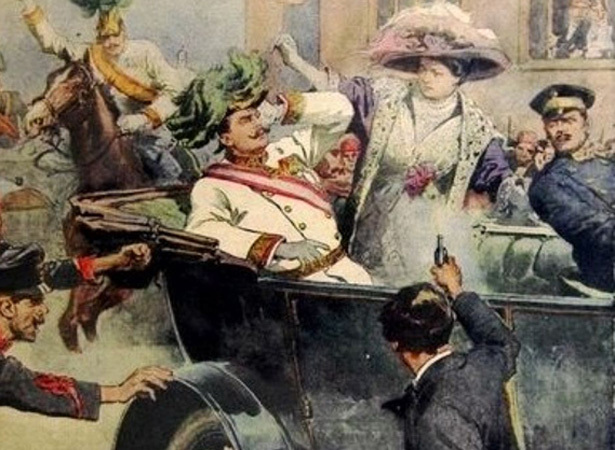 I'm sure we are all familiar with the background to World War I, namely how a guy in Sarajevo stopped to buy a sandwich, saw the Archduke Ferdinand go past in his carriage, grabbed his gun, ran outside, and shot him, thus triggering a series of events that would shape the 20th Century (though that story is a somewhat a myth - apparently he planned to meet the Arch-Duke there, it still sounds good). In fact, one can go even further back to when the French ambassador ran into the Prussian king, had an informal chat which was twisted by the German Chancellor to start a war against the French, which in turn laid the groundwork for what was to become World War I. Well, we could go even further back than that, because in my mind everything is connected, and decisions made hundreds of years ago have a flow-on effect right down to the present age. However, this isn't a piece on alternate history (though I did write an alternate history of World War I a few years back, namely what would have happened if Hitler didn't survive the trenches, but I have since lost it), but rather a continuation of my previous post where I talked about some of the things that I found out as I traveled to parts of the Western front. Previously I wrote about Ypres, but this time I'll be writing about the Somme. Before I continue though, I'll say a few things about some of the events that led up to the war, and the battle. As I mentioned, the seeds were sown during the Franco-Prussian War. At the time Bismark was attempting to unify Germany. Up until that time, Germany had simply been a collection of principalities and city states that had a lose connection under a pretty powerless emperor. This is one of the reasons why, when you travel to Germany, you will note that the country is actually quite decentralised. Sure, we have Berlin over in the East, which happens to be the capital, but there are also a large number of cities along the Rhine. In a way, Germany is similar to Australia where the states actually have quite a lot of decision making power. Prussia was actually a relatively new entry to the European community, having been built up militarily during the 18th Century. Bismark, through a series of political maneuvers, have basically united most of Northern Germany, however he still needed to unite the South to create a unified German state. So, to do this he staged a war against France, which they easily won, and the spoils of war not only included the provinces of Alsace and Lorraine, but also the southern Germans agreeing to become part of single German state. My history teachers taught us that this period of nationalism was something that was coming about in the 19th Century - namely that you ceased to be a subject of the king, and started to be the citizen of a nation. A part of this came about due to the development of democracies. Okay, as I have argued previously, the seeds of nationalism were sown as far back as Jean d'Arc, with the argument that France was for the French and not the English. However, this period we see the unification of Germany and Italy - two previously splintered areas all bound together by a common language and culture (to an extent - the beers are much bigger in Southern Germany than the Northwest - in fact Bavaria is literally a world of its own). Another thing that was happening at the time was industrialisation and colonialism. Unfortunately while Germany had managed to industrialise pretty quickly, they came pretty late to the colonialism game, only managing to snag a couple of territories in Africa and some islands in the Pacific. However, of concern, was the fact that Germany, now unified, had become a manufacturing powerhouse, and a competitor to Britain. In a way it was not too dissimilar to what is currently happening with China. Furthermore, the economies of Germany and England were intertwined, despite the competitiveness. Another thing had happened were a series of treaties, and these would changes quite regularly. At the beginning of the 19th Century, Britain and France were at a war, while they were allies with Prussia and Russia. Come the middle of the 19th Century, Britain and France were allies, and Russia was the enemy. As the 19th Century turned into the 20th Century, all of a sudden Britain, France, and Russia were allies, and Germany was the enemy. In a way it was all about having a balance of power, and the goal was that one state wouldn't become so powerful as to be able to dominate all of Europe (or disrupt British trade). The thing was that despite the simmering tensions, and the growing animosity towards the Germans, nobody actually saw World War I coming. In fact it came as quite a shock. One minute people were going about their business, and suddenly everybody is mobilising for war. Austria declared war against Serbia, thus invoking their treaty with Germany, who also declared war against Serbia, which in response Russia declared war against Germany, so Germany responded in kind, which resulted in Britain and France declaring war on Germany - suddenly all bets were off. The original plan that the Germans had was to invade France through Belgium (which they did) and then swing around to the west of Paris and surround it, thus pushing for a quick end to the war. This was the Schieffen plan, and was based on their earlier victory over the French in the Franco-Prussian war. However, as it happens with most plans, they decided to tweak it a little, and ended up coming down to the East (which as it turn out was counter-productive). The thing is, the Germans didn't reach Paris, though the got pretty close (and the army commandeered taxis to move their troops out to meet the Germans). They were stopped at the Marne, where a battle ensued. Having their advance blocked at the Marne, the Germans then attempted to outflank the French and moved north, only to meet the French (and the British, who were quickly mobilising). The two forces then continued moving north, both attempting to outflank the others, until they got to a point where they couldn't move any further north - the English Channel. This was known as 'the race to the sea' and resulted in the stalemate that pretty much lasted for the rest of the war. as both forces moved north, they pretty much dug in behind them, resulting in the two lines of trenches that the soldiers spent most of the war shivering inside. As we are all well aware, the Western Front was a pretty static front, with movements being very small, and even when one position was captured, it was usually lost pretty shortly after. There is a saying in Australia that during World War I, the ANZACs would make most of the gains, and the British would pretty quickly give them up again. Then again, being Australian, there is always this tendency to make our troops sound much better than they really were. Remember this is the same army that lost to a bunch of birds shortly after the war ended. The thing about the Somme is that it was the location where the French and British armies met. The British, and other Commonwealth, troops were deployed in the trenches to the North all the way to the English Channel, while the French were deployed in the trenches to the South all the way to the Swiss Border. It was also along this section that the Americans ended up when they entered the war. Like the area around Ypres, the fields of the Somme are littered with graves and other memorials. One of the first places we visited when we went on our tour of the Somme was the Australian memorial. As I have also previously mentioned, even though this was technically an Australian memorial (and is owned by the Australian government), when you wander through the cemetery you will discover that there are troops buried here from all over the commonwealth. Back in those days there wasn't a way to safely transport bodies so they were basically buried where they fell. Near the memorial is the village of Villers-Bretonneux, which if you travel through you will discover that there is quite a lot of Australiana scattered about. In fact all of the streets are named after places in Australia. 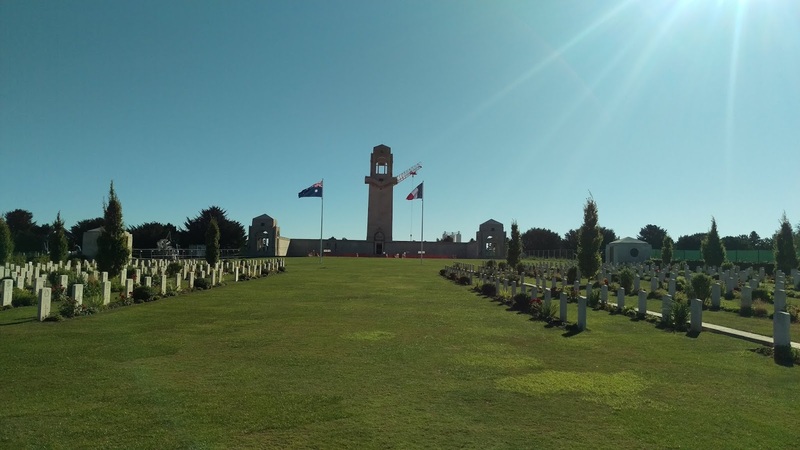 Ironically, we Australians know absolutely nothing about Villers-Bretonneux, and would probably be quite surprised if we ended up there to discover how Australian focused it was without knowing the stories behind it. The reason for this is that near the end of the war the Germans staged a final push at the Somme, and broke through and attempted to march towards Amiens to attempt to capture the city and thus have a direct route through to Paris. Unfortunately for the Germans, when they arrived at Villers-Bretonneux, they met the Australians, and as they say, it was all over red rover. The battle of the Somme breaks a lot of records, and for all the wrong reasons. It was a battle that involved the most number of people (over two million), resulted in the most number of casualties (over one million), was the biggest loss of life in a single day for the British, and could also be considered (up to that time at least) the loudest battle in history in that the barrage could be heard from as far away as London. Initially the battle was supposed to be a combined France-British attempt to break through the German lines and bring an end to the War. The problem was that the Germans launched an attack at Sedan forcing the French to deploy a lot of their forces away from the Somme region, pretty much leaving the battle up to the Commonwealth forces. Oh, and not surprisingly, in the end, the Battle of the Somme really didn't achieve all that much, other than a lot of corpses. Just before the lines was the town of Albert (where we had lunch on our tour). To get to the front the troops had to march through the town, and in the town was a catholic church. During the early stages of the war the church had been hit by German Artillery and the spire damaged. At the top of the spire was an image of the Madonna, and for most of the war it just hung there, suspended above the town square. Being a superstitious lot, when the soldiers went to the front they would pass under this hanging spire and believed that by walking under it they would receive Mary's blessing. It was also believed that once the spire collapsed then the war would come to an end. Ironically, when the spire did finally collapse, it was shortly before the end of the war. There happens to be a museum in Albert as well, but then again there are an awful lot of museums along the Western Front, from the official government ones to the small private ones (such as in the cellar of the pub in Ypres). The Albert museum is located in one of the many tunnels that criss-cross the area, and runs from the side to the church around to the the town gardens. Like many of the museums, there are lots of relics collected from the war, and our tour guide even made mention that he could spend the entire day digging through the treasures located here. Just down the road from Albert is the town of Arras. The main reason that we jumped off the train at Arras was I remember back in year 12 English how Hamlet skewered Polonius, who was hiding behind an arras. Our teacher then went on to explain how an arras is a type of wall hanging that was made in the town of Arras. Ever since then the town has stuck in my head as 'that wall hanging town'. However, since it is pretty close to the front line, I wasn't surprised to discover that there was a museum here - sort of. Arras wasn't just famous for its wall hangings, it was also famous for its quarry. However, these quarries aren't like those open cut monstrosities that you see everywhere, but rather tunneled under the ground. As such there are literally twenty kilometres of tunnels under the town. 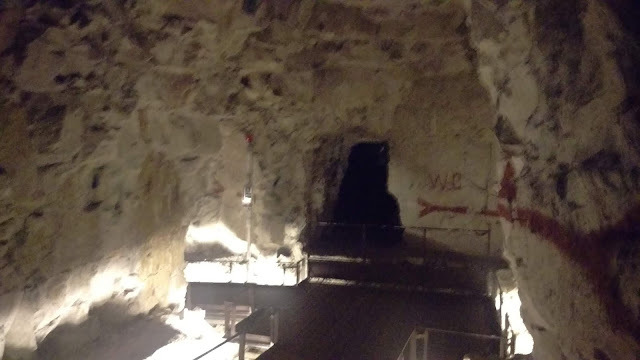 During the war they decided to utilise these tunnels and stationed a huge number of troops - mostly New Zealand, thus the name, which is a reference to the country's capital - hidden underground. The idea was to tunnel under the German lines, and when they least expected it, they would burst out of the ground, and captured the lines. It worked. In fact it worked quite well - everything went according to plan. For two weeks the troops were stationed in the caves, and when they came bursting out of the ground they took the Germans completely by surprise. The troops quickly captured the German positions and continued to push across the lines, with the German defenses literally collapsing in front of them. In fact, this could have been the beginning of the end of the war, expect that it wasn't. As inevitably happens, somebody decided to stop pushing forward and secure the territory that they had captured, which meant that the Germans could the regroup and launch a counter-offensive. The result was all that ground gained was quickly lost. I probably should finish off here, and I was intending on writing about the German's final offensive before the tide was turned, the western front collapsed, and they found themselves being push back into Germany as which time they sued for peace. There are a lot of factors that went into the collapse of the Western front, and no single factor can really be the conclusive reason. Tanks back in those days were pretty much useless, and both sides had them (they kept on getting bogged). The same thing with the airforce, since both Germany and the Allies had bombers. Sure, the Americans helped, and helped a lot, but when they were finally mobilised and joined the Western Front, there was still bit of the war to finish. However, I should point out that unlike the other forces, the American troops were fresh, and this also helped, and helped a lot. Anyway, Germany also had the advantage, since Russia sued for peace, of now only fighting on one front. The interesting thing is that we all seem to think that World War I ended on the 11th November 1918, however that is not quiet correct - that was the end of hostilities. The war didn't officially end until the signing of the Treaty of Versailles a year later. During that period the government of Germany collapsed to be replaced with the Weimar Republic, and the British would also send their bombers over Germany to make sure that hostilities would not start up again. However, when the troops were demobilised, it wasn't the end of the war, or the deaths. Immediately after the war Europe was ravaged by the Spanish Flu, and the fighting also moved further to the East - to Russia, where the allies were now attempting to overthrow the communist regime. In the end, though, this war didn't last too long since by the time the hostilities in the West had ended, and the Spanish flu had taken its toll, the home front was pretty sick of war and the White Russians were abandoned and left to fight on their own.